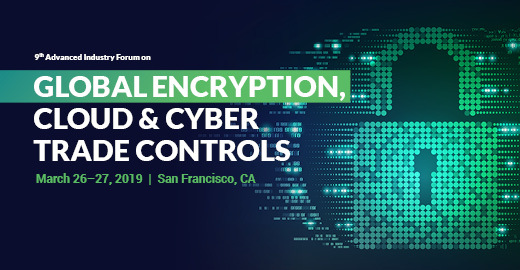 SAN FRANCISCO - Feb. 19, 2019 - PRLog -- American Conference Institute will host a 2-day comprehensive conference on the most pressing issues affecting Global Encryption, Cloud & Cyber Trade Controls. Topics to be covered include New Economic Control Reform Act, Global Regulatory Developments on Cloud Computing along with EU Dual Use regulations. Hear from leading technology companies including Apple, Ericsson, Facebook, Google, McAfee, Microsoft, NetApp, Raytheon, Salesforce, Siemens Healthineers, Silicon Valley Bank, Symantec, Veritas Technologies, and more. More information about the conference including full agenda, faculty lists, and brochure can be accessed at www.AmericanConference.com/Encryption. A unique organization, American Conference Institute is devoted to providing the business intelligence that senior decision-makers need to respond to challenges both here in the US and around the world.